Summer vacations – when most students choose to enjoy and take their time off – Taleem Sab Ke Liye (TSKL) chooses to work. 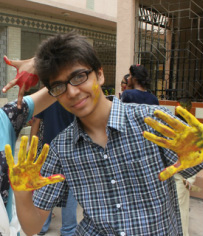 Every year during summers, TSKL conducts its largest project –The Summer School. Fortunately, I happened to be a part of two of the three consecutive Summer Schools that have been conducted so far. Being there and working, working for a better future of those who cannot afford quality education, who do not get the desired level of attention , who might never get a chance to go to the elitist MUNs, and who might not even complete their high schools was, perhaps, the most satisfactory experience for me. Watching them learn, make beautiful cards, score the best goals on headers against me and debate passionately on topics ranging from the impacts of a flyover on their lives to those on freedom, just made my love for the job grow with every passing moment. The urge to play my role in making a difference to lives of over 400 children had attracted me into joining TSKL. But as I came to terms with reality, I realized this was something much more important for them. The fact that even during their vacations, they would start showing up at around 7 30, when only the guard would be there to greet them, speaks volumes of the amount of importance they attach to the school (The school starts at 9 am). Last year, just around the last of our events – Taleem Day – when I started becoming disillusioned about if we had actually achieved what we wanted to, parents and elder siblings who were invited to the event shared their thoughts about the school with me. 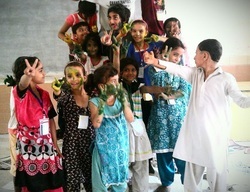 Comments ranged from “Bachon ko bohat maza aaya” (translation: The children enjoyed a lot!) to “Agle saal bhi zaroor kijiye ga” (translation: Conduct Summer School next year as well). But the one I will never be able to forget was “Sab se bari baat yeh ke bachon ne woh seekha jo woh shayad school main bhi na seekh paate” (translation: The biggest achievement is that the children learnt here what they couldn't even in their own schools). And today, just as I was leaving the school premises a father of three students confronted me. “Ji” (translation: 'Yes') was all I could say, thinking something scary was coming my way. And I could do was say 'shukriya' (translation: thankyou) and smile from ear to ear. Whenever I enter 2A all the kids start clapping and cheering ‘Sir Shaggy!’ This happens almost whenever I pass through that class and I hear some kids yelling my name ‘Siiiirrr idhar aye!’ (translation: Sir please come here) or ‘Sir shaggy kay liye taaliyan!’ (translation: Clapping for Sir Shaggy!). The fact that certain kids have become quite attached to me as they shake my hand, tell me their stories while I also share some of my secrets with them. They might sometimes behave in an inappropriate way since there needs to exist a certain kind of respect between a teacher and a student but I guess at certain moments in life one must allow exceptions to a certain rule. I don’t even know whether I’ll see these kids next year hence it is important to spend as much time as I can with them and let them have all the fun right now. I hate these kind of questions since there never is a SINGLE moment, there are PLENTY of moments but the one that I would like to shortlist would be the ‘dance game’ played by the kids during Rainbow Day. I felt before Rainbow Day we were being a bit too stringent on the kids and did not allow them to have any type of fun but during Rainbow day we provided kids ample entertainment. Seeing them dance to ‘Daanay pe daana’ was a sight to witness and I definitely wouldn’t mind revisiting that moment and see their cheerful faces, laughing and grinning. ANGRY MOMS! Ahaha but yeah apart from losing my anger once or twice at the kids, there aren’t any bad experiences that I remember. Have you ever volunteered for anything like Summer School before? I was a volunteer for Summer School last year as well but this year we definitely changed EVERYTHING so altogether it seems like an almost different experience than what I had last year. Would you like to volunteer for Summer School again? It is never about ‘improving your application’ or getting hours added to your ‘community service tab’. I want to see these kids on the same level that we are in, I want them to experience what ‘real’ education is, I want them to understand that education is more than learning ‘abc’ or ‘123’, in order to improve ourselves and our country we must acquire education. If certain underprivileged people do not have access to such an opportunity then I feel that it is our duty to provide it to them and that is why I would love to volunteer for Summer School again and again. It requires a lot of effort but at the end of the day as the children shake your hand and wish you ‘Khuda Hafiz sir’ as they leave the school, you know you have done your job and that feeling of satisfaction that you get from within you is something that I simply can’t express in words. “You cannot acquire experience by making experiments. You cannot create experience. You must undergo it.”-Albert Camus. How true and reflective these words are of my kind of a situation. Not just me, but everyone who was with me. Last year at Summer School I was just a volunteer. I would boast about my time spent there all the time. Well, not because I had volunteered for something like Summer School but because I dealt with the responsibility of ‘serving the community’. This year, everything was different. I was part of the team as their C-level. BIG JOB. BIG RESPONSIBILITY. Would I be able to do it? Yes. What was my motivation? Serving the community? Yes. But not just that, there was much more depth to why I was so eager of taking up the responsibility of running a school during my vacations, that too at a place like Gizri where us ‘cool’ teenagers avoid going. Waking up early mornings at 7, DURING VACATIONS, going to Gizri, setting up the stock room, keeping the stock count, waiting for the children to arrive to school, managing their lines, watching them walk to their classes and returning back to the stock room and handling it was my job. There were times I would get tired or frustrated, but what kept me going on was the smile at the kids faces that was priceless to see. Knowing that you’re doing a good job is not sufficient enough to keep one going on. When you’re there, you have to have love for what you’re doing. So was my case. I loved what I was doing (though I was a bit sad I was unable to teach due to the other responsibility I had) but nevertheless the experience was all the more better. I’m a kind of a person who hated children, but all of this changed right at this place. Whenever we had our events, I would join them and would forget that I was their ‘Miss Laila’ (that’s how they pronounced my name) and dance with them on songs or play along different games. To be honest there’s too much that I learnt and I cannot telescope it into a few paragraphs. The feeling of satisfaction that I get every day, after reminding myself of the times at Summer School, is definitely exceptional. May be I made a difference to those kids life, a significant difference, that they would carry with them for the rest of their lives. In the end, it’s not only about us but about those as well who have been deprived off of their rights. Every moment was something new and extravagant. Starting from the events such as the orientation till the end, everything has brought a change in me and lightened up everyone’s moods. Have you volunteered in something like Summer School before? happy. In the end, we make these kids smile laugh, as it makes us do the same. One of the funniest moments I have had at Summer School. Yes, I would certainly love to revisit this moment. Ayesha, one of the play group students came to me one day after school was over and jumped on my back for a ride. I LOVED it and would LOVE to revisit that moment!! Nope, had a wonderful time at the summer school. No bad experiences. 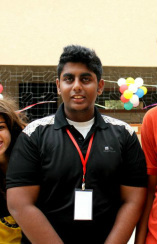 I haven't volunteered for any NGO ever before and TSKL's summer school was my first time. Yes I would love to volunteer for summer school again. It was a pleasure to be part of it! It taught me working together with so many people I never knew and then gelling with them in such a short span of time, I had never experienced anything like this before. Managing the class, maintaining discipline, teaching the children to walk in one single line, it taught me how important discipline is in life. And I constantly get the thought that I am studying in the best college in Karachi, what if my parents did not have the resources to send me to a good school even, how hard life would have been then.Summer School, apart from being a fun, was a learning experience for me too. Cheers to our team and to our NGO! Well, its a bit difficult to decide which moment was the best. But probably I'll say the best moment was during the football match.I had a good chat with grade three kids. What really made that chat special was how they treated me.Before this, they always used to treat me as someone superior to them.But this time their behavior was quite different, they felt comfortable in discussing their school life as well as their opinions about other volunteers at summer school. I would like to revisit this moment (mentioned above) and would want to hear their interesting and funny comments about me. How did you get past them? Obviously..I would love to volunteer for Summer school again. Apart from the element of fun..I used to feel good when I worked there. It gave me a sense of satisfaction and happiness that I did something for those kids. I wouldn’t say that every single second or day was the best moment ever, but what I would say is that there were many events which took place and I actually don’t want to relive them, well that’s because I know that I still have a week left and what is to come is going to be something much more amazing, although there were some events which took place which I could never forget. It’s a common perception by most of the people who just sit on their couches, whine about everything and criticize on how much of a difference we could make in just a month in the life of a kid who has not been groomed at all from its birth, well I would like to educate everyone with how much of a difference we’ve made in some of the kids lives and behavior, we have the case of Nouman, he’s a playgroup student who was with us in the previous summer school as well, when we were enrolling him, we were told that he is one of the most rowdiest and the most violent kids of them all and true they were, in the beginning of summer school we could see Nouman standing outside the dean’s office practically every day, however since the past two weeks, you could see the exact opposite of what Nouman was, we have affected the kids life to a great extent. He would be one of those few kids now who would be standing in the morning from 8 am until school starts at 9, we can see him looking upto us and that feeling is by far the best feeling ever, you feel proud of yourselves in moments like that. Except of that there were few other moments which make me smile when I think of them, I was one of the few volunteers who had been in this thing since the beginning, so I remember how hard it was to convince people to send their kids to our school, we used to go on streets, door to door and convince people to send their kids and when I came back from the streets and I was helping with the registrations, it was a really proud moment for me to see people whom I had convinced coming inside the school with their kids to get their kids in summer school 2012. The moment I want to revisit was when after a week of hard work and convincing people and spending almost the whole week invigilating the admission exam when we had finally hit our target of 450 kids. If I get the chance to then yes,I would. I want to revisit every single day at Summer School. THE HEAT. I sweat a lot. The heat kills me every day at Summer School when I'm doing house keeping. Makes me realise how important Air Conditioners are in today's society. It's quite simple.. I drop the broom, sit in my class, turn on the fan, and start counting today's stationary. No, I haven't volunteered for anything, to be honest. Stupid question. I love the kids, I love the place, I love the staff. I love Summer School! The experience I got from it is LITERALLY awesome. I hope to volunteer for TSKL every time it needs me. I believe TSKL, MBAKH (Meri Bhi Ek Khwahish Hai), SCWP (Senior Citizens Welfare Program), Nixor Hospital and all other NGOs everywhere operate for a cause worth giving time to. Pakistani youth, and most importantly, the elders need vision and hope. The hope comes from these NGOs that can show that you do not need fancy cars and government passes to change future. You need a heart. Courage will come along with it. It will be quite sad if TSKL fails, and I don't want that to happen. So whoever is reading this, please, be a part of a greater cause. You might be a brick in the wall, but that wall needs you else the foundation would be loose and the wall will crumble. That wall is the Earth we live on. so many memories that I ditched all internship offers from top notch companies and different enrichment classes this year just to be a part of these group of individuals who thrive on the passion to bring a change to this society through Summer School 2012.
school actually looked forward to coming back the next day not because they got the chance to play various games at a level they never had before but to educate themselves not only in subjects like English and Math but Public speaking, Ethics and Manners which have been the most effective in Summer School's one month time period example being the Play Group kid Noman who started off as by far the most problematic kid at Summer School and went through such a drastic change that he became the Red house captain. that magic show to see those countless smiles or when Izhan couldn't stop wondering that how the magic show man made water come out of his ear, I'd like to revisit Sports day when the house colour and passion defined every student and In simple I'd want to revisit every day at summer school all over again. At summer school I don't seem to recall a bad memory but some thing I regret was when we had to turn away like a hundred parents and kids because our registrations were full and we just couldn't accommodate anyone anymore. Those sad faces were a sight that I couldn't stop wishing that we could take all of them, It was such a hectic day that we had to shout at some kids to turn them away because they were so determined to be a part of what this team stands for. There is no project I have ever found like summer school even if I looked that is why I just cant stop being a part of it and I'm pretty sure I'd be a extended member of Summer School 2013 being in my university because I've become family not only to this team but to the kids who come to summer school. I just wish we could do this on a much bigger scale extending over a longer time periods so these smiles we bring for a month could be there forever. Well, honestly, i really cannot pick one moment as the best moment, because every moment was better than the other. Every second at summer school was my best moment, and i really do not have words to explain this journey. Starting from the orientation till the graduation, they all were my best moments. YES! No doubt about that. If anyone asks me even half heartedly to join it, i would join it more than happily, and wish to live every moment to its fullest. Because i had a lovely time, this year. and i am sure that it will be even better next year. And the feeling that i got, that i was educating the next generation of pakistan, was a feeling better than any other. And also because i could not have spent my summer vacation any way better than i did with the summer school. I think this is a wonderful organization which is really going to shape up pakistans future generation. I wish it the best of luck. I wish there could be more organizations such as this one. The entire summer school 2012 experience was epic and was an experience which will always be remembered. From the very first day it had moments of great awesomeness and right to the end the fun, excitement and joyful experiences kept going on. To name a best moment at summer school would be bias as the entire length of time the summer school prevailed was epic and no specific best moment can be named as the entire experience was epic. and thus there isn’t a moment I would like to revisit but instead it’s the entire experience that I want to revisit! Any bad experiences and if so how would you get past them? Nothing is perfect. And so was the case with my experience at summer school. There were a few bad experiences like the times when the students got fed up and bored with what I was teaching and they would lose interest and then would become troublesome and get out of control. To get them under control would be difficult but not impossible. Most of the times I used to do this was I would just tell them that if they keep quiet for a few minutes I would tell them a story or that we would play a game! 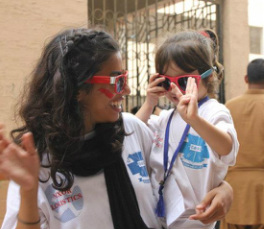 Have you volunteered for anything like summer school before? Would you like to volunteer for summer school again and if so then why? Yes surely. If given the opportunity I would love to be part of this project again because the whole idea and aim of this project is magnificent. To teach the underprivileged and to educate, enlighten and inspire is a view which I not only like but also it’s the view I share. Also in summer school I got to learn many new things and also made many new friends. TSKL is a wonderful entity. Not only is it working for a great cause but the people who are running it are doing a great job and are running this entity magnificently. Being such a successful entity and working for such a noble cause it was a great pleasure working for it. There’s nothing I didn’t love about summer school, but what was really awesome was the cleaning, from sweeping and mopping to getting down on our knees and scrubbing the floors spotless, and everyone worked together cooperating like a team, you feel good when you know all your hard work is helping out for a greater cause, it was nice. Howd you get past them? 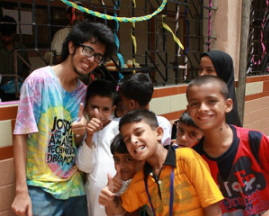 Ofcourse I have the situation in Pakistan isn’t getting any better and I cant just sit there and let things run amok, so I take every opportunity I get to help those in need, in places like SIUT, Darul Sukoon, TCF, and even at school, where ever. Is that a trick question? It goes without saying I ,I've met amazing people and this has been a great learning experience too, most of all I know that ive helped in opening the eyes of many children to new horizons and instilling in them the value of humanity, until next year. Everyday ,at around 9:00 am, I see the kids run towards class after assembly.The enthusiasm on their faces really makes my day. The first time a student presented me with a flower to show her appreciation.Although it had withered within an hour or so, that flower, for me, was more beautiful than the fanciest of bouquets. cousin who whacked him inn the head with a piece of wood fitted with a keel(nail) after he had gotten into an argument with him. To hear such a traumatic story from such an innocent child really was an experience to forget. I haven't. Every time I see him in class, I have an urge to be a litte more kinder to him than the rest of the class.But then I remember that as a teacher I have an obligation not to show any favouritism, so I try to look past his story. conditions not nearly as hospitable; but I see these kids enjoy their school more than I enjoyed mine. Just goes to show you never truly appreciate the small things in life because you take them for granted.But for these kids, Summer School is an opportunity for something they never thought they could have, a modern education and an average childhood. I believe that the more fortunate amongst us should see it as a responsibility to do something for those who were not as lucky to have what we have, for something they never had the option to have.